The Supporters' Shield is an annual award given to the Major League Soccer team with the best regular season record, as determined by the MLS points system. The Supporters' Shield has been annually awarded at the MLS Supporters' Summit since 1999, and has been recognized as a major trophy by the league. It echoes the practice of the top European leagues in which the team with the best record is the champion. Since 2006, the Supporters' Shield winner has earned a berth in the CONCACAF Champions League. D.C. United and LA Galaxy, with four Supporters' Shields each, have won the most shields of any MLS team. New York Red Bulls are the 2018 holders of the Supporters' Shield winning it for the third time. When Major League Soccer had its inaugural season in 1996, the league resembled its contemporary North American leagues. After the regular season, the campaign culminated with the MLS Cup Playoffs, en route to the postseason championship match, the MLS Cup. The club with the best regular season record received nothing more than the top seed in the playoffs. In 1997, soccer fan Nick Lawrus proposed the notion of a "Supporters' Scudetto", as a result of the Tampa Bay Mutiny earning the best regular season record but failing to win the 1996 MLS Cup final. A committee composed of members of all MLS teams' supporters changed the name to "Supporters' Shield" but, due to disagreements between members of the committee, the proposal failed to come to fruition. The following year, another group led by soccer enthusiast Sam Pierron tried to revive the idea by giving an award to the regular season champions. Since MLS refused to fund the idea, Pierron began fundraising to purchase a trophy with the help of supporters from various MLS clubs. Fundraising was boosted with the assistance of ESPN commentator Phil Schoen making a donation. In the end, nearly $3,000 was donated to commission the trophy, which was made by artist Paula Richardson out of sterling silver sheet metal, for $2,200. 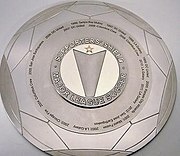 The process to create and purchase the Supporters' Shield was not completed until the tail end of the 1999 season. While D.C. United were the first MLS club to win the award, the first place finishes between 1996-1998 have all been awarded the honor retroactively, with their names included on the shield at the time of its creation. Frankie Hejduk of Columbus Crew, was part of the team's three Shield winning campaigns. These are standard MLS regulations for breaking ties in point totals. Throughout the early to mid-2000s, the Shield received little praise or recognition from MLS or the general public, as the league awarded the MLS Cup winner and runner-up with spots in continental tournaments. In February 2006, USSF decided that the Supporters' Shield winner and the MLS Cup winner would represent the United States in the CONCACAF Champions League, formerly the CONCACAF Champions' Cup. If the Supporters Shield winner also wins the MLS Cup, the team with the second highest regular season point total qualifies as well. When the Champions Cup became the CONCACAF Champions League, the United States Soccer Federation gave the Supporters' Shield winner and the MLS Cup winner both direct Group stage spots into the tournament. On seven occasions (1997, 1999, 2000, 2002, 2008, 2011 and 2017) the winner of the Supporters' Shield also won the MLS Cup that same year. In 2011, the league announced that the Shield winner's opponent in the MLS Cup quarterfinals would be the lowest-seeded team remaining. Team also won the MLS Cup. Luciano Emílio won the Golden Boot in 2007, the second year of D.C. United's back-to-back Shield winning seasons. Before 2006, Shield winners were not guaranteed a berth into CONCACAF competitions. Most regular season champions to earn berths into CONCACAF competitions typically earned them from earning a berth into the MLS Cup, or earning a berth due to the number of berths allocated to the United States for MLS. Most times, the United States was allocated two berths into the tournament, which went to the MLS Cup champion and runner-up. Since 2007, the Shield winner replaced the MLS Cup runner-up as the second American representative for the CONCACAF Champions' Cup. In 2008, with the arrival of the newly formatted CONCACAF Champions League, the Shield winner, along with the MLS Cup winner both earned direct byes into the group stage of the Champions League. A Shield winner has never reached the final of a CONCACAF competition. On three separate occasions, D.C. United has reached the tournament semifinal after winning the Shield, the furthest that any Shield winner has progressed in CONCACAF competition. United also holds the record for the earliest exit in a CONCACAF competition as the Shield winner, being eliminated from Group stage in the 2008–09 edition of the Champions League. ^ 1: Toronto FC participated in the 2018 CONCACAF Champions League by virtue of their Canadian Championship win, not the Supporters' Shield. ^ 2: Due to the restructuring of the 2019 CONCACAF Champions League, the United States' berths were allocated to the 2017 and 2018 MLS Cup winners and the 2017 and 2018 U.S. Open Cup winners, and the 2017 and 2018 Supporters' Shield winners were not guaranteed a berth. As Toronto FC won MLS Cup 2017, the vacated berth was reallocated to the New York Red Bulls as the U.S.-based non-champion with the best aggregate record for the 2017 and 2018 MLS regular seasons. B. ^ From 1996 to 1999, 3 points were awarded for a win in 90 minutes, 1 point for a shootout win, and 0 point for a loss in 90 minutes or shootout. Since the 2000 season, 3 points are awarded for a win, 1 point for a tie, and 0 point for a loss. ^ Gates, Ryan (February 15, 2011). "A History of the Supporter's Shield". Stumptown Footy. Retrieved October 8, 2011. ^ "Competition Rules and Regulations". Major League Soccer. MLSSoccer.com. Retrieved September 23, 2013. ^ "Qualifying Format Unveiled for 2008-09 CONCACAF Champions League". CONCACAF. CONCACAF.com. May 14, 2008. Archived from the original on December 26, 2008. Retrieved January 6, 2012. ^ "CONCACAF Champions Cup/League History" (PDF). CONCACAF. CONCACAF.com. Archived from the original (PDF) on September 16, 2011. Retrieved January 6, 2012. What is the Supporters Shield? This page was last edited on 22 March 2019, at 03:12 (UTC).